Although Lego Dimensions won’t be out until September, we’ve already had a pretty good look at some of the game’s extra expansion packs. But an instruction manual uploaded to Lego’s website has given us even more news: our first look at Lego Doctor Who, and confirmation of Lego Portal! The pictures come from the instruction manual to the Back to the Future level pack for the game, which was posted to Lego’s online repository of instruction booklets (and hastily removed once the news got out) yesterday evening. The manual included advertisements for a variety of Level and “Fun packs” including characters from The Simpsons, Jurassic World and Scooby Doo — but the most significant finds were levels packs for both Portal 2 and Doctor Who. 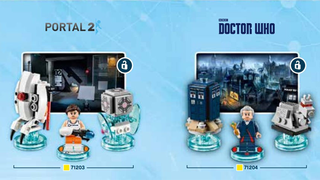 The Portal pack comes with main character Chell, an Aperture Sciences turret and the series’ iconic Companion Cube, while the Doctor Who pack features Peter Capaldi as the Twelfth Doctor, and brick-built versions of the TARDIS and K-9, the robot dog companion of several past Doctors and companions from the show. Aside from the figures both packs will unlock themed levels to play in the game.